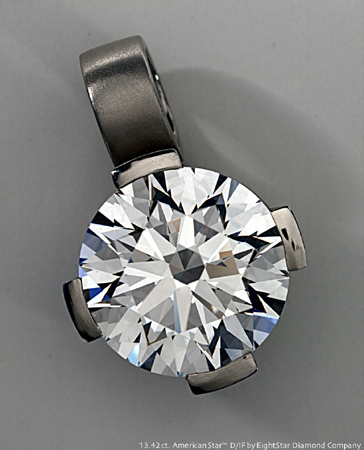 The American Star Diamond began life as an unnamed 14.89-carat D-color, Flawless-clarity modern round brilliant. It was bought in late 1999 by the EightStar company of California, with the intent of a recutting. The plan was to prove, on a large scale, that the EightStar approach brings otherwise unattainable sculptural and optical perfection to the round brilliant, even ones the rest of the world already thinks are as good as it gets. As with every EightStar diamond, the American Star was cut using an exclusive light-tracking instrument called a 'FireScope' which allows cutters to align facets so precisely they can completely control the flow of light into and out of a diamond. "Without a Firescope, diamond cutting is guesswork," says Richard von Sternberg, EightStar's founder and president. "With it, our cutters look inside a diamond and fix fatal problems other cutters never even see." After taking ten months for planning, including the design and manufacture of custom cutting equipment, the diamond was slowly recut from 14.89 to 13.42 carats over a six-week period in September-October 2001. "One reason for the slow grind is that EightStar cutters consult with the Firescope at every stage of work," von Sternberg notes. "Ordinarily, that means 200 Firescope checks. In the case of the American Star, however, I lost count at 500." Given such attention during cutting, it shouldn't be surprising that EightStar produces less than 2000 diamonds every year. "Since the key to diamond beauty is cutting for maximum light output, we treat every diamond, regardless of size or quality, like a potential masterpiece," von Sternberg insists. "So we cut the tiniest engagement diamond to the same high standard we would cut a giant diamond destined for a royal crown." Once an EightStar diamond is finished, the Firescope plays just as important a role for consumers as cutters because it furnishes irrefutable proof that every EightStar has achieved light optimization. That proof: a unique eight-rayed spear-like pattern called, appropriately, an 'EightStar.' 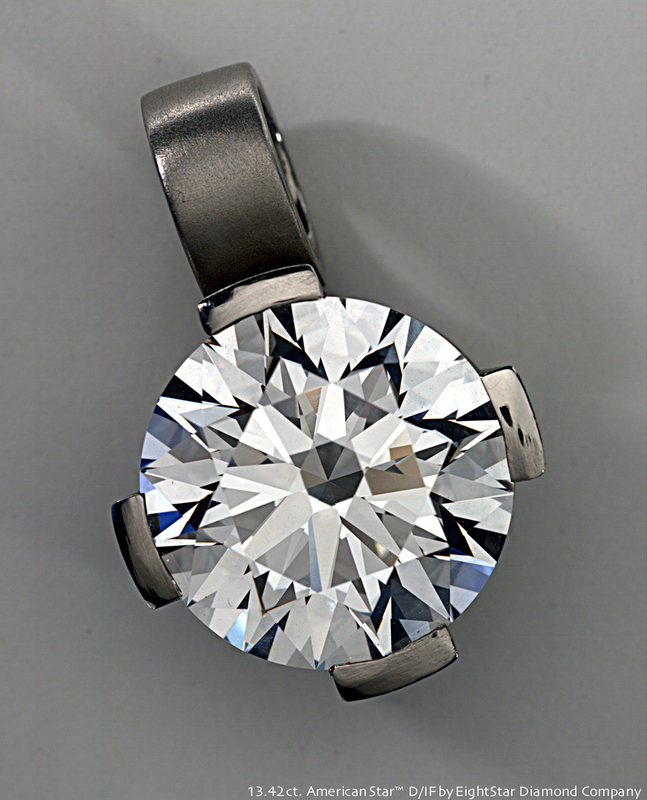 EightStar dealers almost always deal in regular standard round brilliants as well as EightStar stones, so customers can easily compare the two cuts. To most of EightStar's competitors who cut for bulk not beauty, sacrificing 10 percent of a D-color IF-clarity 15-carat diamond's weight is a catastrophic loss. But Mr. von Sternberg sees the loss as a gain. "What is it about a diamond that you notice first and foremost from clear across a room?" he asks. "Its blaze of white light or its glitter of spectral fire. Hence we have no choice but to cut for sizzle not size." It should also be noted that several of EightStar's competitors do not cut fancy color color diamonds, sticking to colorless and near-colorless stones, which they consider to be more marketable, despite the growing trend towards fancy color stones. This is not the case with EightStar. In early 2005 the company sold a fine natural blue EightStar diamond of approximately half a carat. Its exact color grade is not known but is rumored to be better than Fancy Blue. The gem appeared in the February 2005 edition of Robb Report magazine and is arguably the finest cut round natural blue diamond in the world presently. Special thanks to Richard von Sternberg and Martin Haske for information! Other sources: Robb Report magazine, Jeweler's Circular Keystone. For more information about the American Star tour, the EightStar diamond or the Firescope, see www.eightstar.com. Note to editors: Richard von Sternberg is available for interviews.